This archive holds all posts form June 3, 2009. 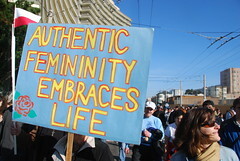 The recent murder of Dr. George Tiller by an anti-abortion terrorist raises some complicated questions about racism and the ways that it is interwoven with issues of gender and sexuality ( photo credit: Steve Rhodes). Dr. Tiller’s assassination happened on the sixth anniversary of Eric Rudolph’s capture, As one of the leading investigative journalists on the far-right, Sara Robinson, writing at Orcinus notes, and “the date was chosen with a message in mind.” In case you’re not familiar with Rudolph, he was arrested in 2003 for a series of bombings in what envisioned as a guerrilla campaign against globalization (by bombing the Olympic park), abortion (bombing an abortion clinic) and “the homosexual agenda,” (bombing a lesbian and gay bar), all seen as threats to the male-dominance and white supremacy of the “Army of God” group to which Rudolph belonged. Like Rudolph, the suspect arrested in Tiller’s murder, Scott Roeder, has ties to a right-wing extremist group, the Sovereign Movement. I would not be surprised to learn that Roeder had a “shopping list” of targets similar to Rudolph’s. Yet, it’s far too simplistic to locate racism on only one side of the “pro-choice” vs. “anti-abortion” debate. As Joe pointed out in a post last year, Planned Parenthood has recently been hoisted on the pitard of its own racism. This “sting” operation was the work of the anti-abortion movement’s latest spokesperson, Lila Rose, a 20-year-old UCLA undergraduate. While pro-choice advocates are quick to dismiss such tactics as another salvo in the ongoing war between the extremely polarized sides of the abortion debate, the white-dominated reproductive rights movement in the U.S. should not be let off the hook so easily. Anti-abortion advocates such as Rose are correct when they point out the racist history of early abortion and reproductive advocates like Margaret Sanger who was, in fact, motivated at least in part by eugenics and a desire to see the “right kind of women” (read: white, middle-class) having children while discouraging the “wrong kind of women” (read: immigrant, poor, non-white) from reproducing. Anti-abortion advocates are also correct when they call out organizations such as Planned Parenthood for their two-faced racism. However, to do that without also recognizing the deep ties to white supremacy in the anti-abortion movement, is to put it mildly, disingenuous and suspect. It seems clear that the effort to call out the racism of Planned Parenthood by the likes of Lila Rose is less about a concern for the reproductive rights of women of color and with it racial justice, and more about advancing the cause of denying women the right to safe, legal abortions through a movement with deep ties to white supremacy. Before the rise of the religious right, the United States had a long and controversial history of bringing contraception and safe abortion services to the developing world, and encouraging changes in cultural norms and desired family size. This was generally driven less by concern about women’s rights than by terror of overpopulation, which was incredibly intense in the 1960s and 1970s. Since then, women’s rights activists have mostly taken over the structures created by the population controllers, and they’re also doing work that helps women around the world challenge prevailing power arrangements. Partly as a result, conservative and fundamentalist forces accuse feminists of being American imperialists. In Nicaragua, Daniel Ortega’s Sandinista government cloaked its draconian abortion ban in anti-colonialist rhetoric – even though his policy mirrored that of the hated United States! At the same time, both American conservatives and representatives of the Vatican revel in posing as the staunch defenders of traditional cultures under assault by decadent cosmopolitan elites. They really enjoy turning traditional leftist critiques against liberals. Here, once again, the religious right is engaging in an old strategy of “turning traditional leftist critiques against liberals.” This time the issue is racism. While the ties within the anti-abortion movement to white supremacy are strong and well-documented, those in the movement will try to turn the tables and charge racism against those in the pro-choice movement. However, the standard liberal response of “colorblindness” and a lack of a critical race lens forestalls any ability to counter these charges except in the most facile and ineffectual way. And, the almost all-white, mostly straight and overwhelmingly female composition of the rallies in support of Dr. Tiller speak to the failure to build a transracial and inclusive reproductive rights movement in the U.S. The assassination of Dr. Tiller by someone with alleged ties to a group that advocates white supremacy, male dominance and heterosexuality as divinely inspired, should remind us all of the importance of working toward a just future across these differences.